One of the larger battery sets I've seen at 27"W x 12"H x 15-1/2"D. This five tube radio is being offered in as-found condition. The top will need minor veneer repair and it is not original to the set. 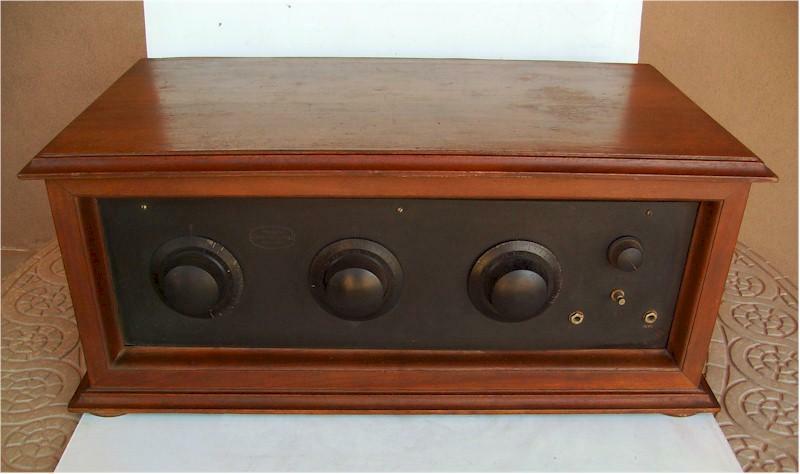 The lid is from a Colonial 16, but the balance of the radio is Arborphone. There is some discoloration that should completely come out when stripped and sanded. The rest of the cabinet is still very nice and original. The front panel is dull, but no cracks or chips. It appears complete inside minus the tubes. The interior needs some cleaning and the lid support is broken. I didn't see any problems with the coils and wiring.